Living in Israel may affect different people in different ways, but one thing we all seem to have in common; we pick up on the same words. I have yet to meet a non-Israeli who spent time in Israel, or among Israelis abroad, and did not learn to use these words. When it comes to myself, regardless of which language I am speaking at a given moment, I simply don’t know anymore how to NOT use these words! So when I talk to people who have never been in Israel, or doesn’t speak a single word of Hebrew, they obviously have no idea what so ever what I am saying unfortunately. But seriously, what do you say instead?! I often feel like there is just no word for me in English, or in Swedish, which sends the messege across as effectfully and effortlessly as these words do. The ultimate word/slang for saying ‘okay’, ‘cool’. ‘fine’.”I am sababa”, “The movie was sababa”, “Sababa, so see you later”, “Everything is sababa”. Originally from the Arabic language, but used very frequently also among Hebrew speakers. 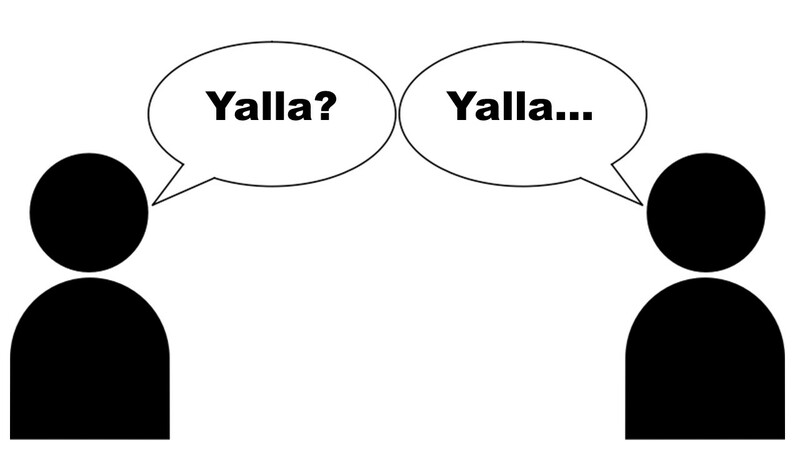 What word can possibly have as many meanings as ‘Yalla’? Depending on your tone of voice and the context, it can mean “Let’s go”, “Hurry up”, “See you later”, “Ready to go?”, “Let’s do it”… the variations are endless! My favorite is how it can be used to effectively end a phone conversation once you’ve said what you need to say; “Yalla, bye”. Just like that. Means ‘darling’. It’s just a cute word, I prefer it over the English version. “Hey motek”, “You’re such a motek”. When things are not happening in the speed you would like them to (or at all), or people don’t do what you want them to do, or they don’t answer your questions when you expect them to, a slightly encouraging (or annoyed) “Nuu?! ?” usually helps to get things back on track and moving. Just like that…”Psssshhhh…”, it’s just a sound, but it just says what you want it to say; “Wow”, “Nice”, “Hot”, “Cool”, “Damn”, “Well, aren’t you a bit of a show-off”. It’s Arabic or Turkish for brothel. Same meaning as Balagan, just without the bothersome or negative aspects concerning a mess or tanglement. Motel its more sweetie than darling, also you have “mAmi” almost same meaning, darling, dear. Olami is one of my favourites…..
Re’ga (רגע) (also Ra- Re’ga) means “one moment” or “a short time”, depends on the context and facial expression or proper hand gesture, could also mean, “have patience”, “in a moment”, “keep calm, control yourself” (See also: “Shni’ya” a second, of time). It could also mean “Never really” or “When hell freezes over” “Just watch me!”. Tachles, I don’t know how you can live here without this one. This is the one I missed the most when first living abroad. I decided it's time for a fresh and perhaps slightly food-obsessed start here on instagram 😋 So those interested in following can do so @vegan_mama_nika from now on. See you there! Psychology BA student by day, writer by night, and traveler by heart. Veronika is a Swedish nationality who left Sweden to travel the world a few years ago, and ended up in Israel. She has been calling Tel Aviv home since then, and she loves to share her thoughts and experiences from life in the "bubble" of Tel Aviv through her blog, Bubble Perspectives.